I can hardly believe that it’s September already! Where did the summer go? OK… to be completely honest, Fall is my favorite season. I love wearing jeans and cozy tops, and I love pumpkin flavored everything. I love the fall colors, too! The Pattern Pack theme this month is “Fall Into Fashion,” and the 6 fantastic designs are waiting to be crocheted! The weather will (hopefully) cool down soon, and you should be prepared. Abigail Haze and ACCROchet both created beautiful tops to keep you cozy and stylish! Keep your shoulders warm with one of the two fabulous shawls brought to us by Amber Millard and Red Heart. And finally, Anastasia Matyakh and Natalia Johnson both designed gorgeous clutch purses that can be made to match any outfit! One of our favorites this month is Natalia’s Chunky Lace Purse! It works up quickly, has a cute, lacy flap, and is finished off with 2 buttons to keep your belongings secure. 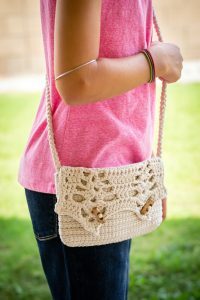 I don’t like to carry a big purse, and this one is definitely on my to-do list! It is a great gift idea, too! TPP Subscribers will find the September Pattern Pack in the Members Area when they log in to our site. Not a Member? No Problem! Grab this Pattern Pack on Ravelry HERE. Let us know: Which pattern will you crochet this month? Oh my, Oh DINOSAURS! Two FREE Patterns!